Akzhigit Koramsiuly (1843-1913) - bard and composer. He praised the reality soulful lyric songs, speaking at the same time as a composer, as a poet and as a virtuoso performer. He wrote many lyrical songs, "Syrymbet", "Makpal", "Karamar", "Akkoylek", "Aktokty", "Perizat", "Hay cook", etc. Deeply and vividly depicted in his songs and pictures of falconry, and wanderings, and the image of the horse pacer. His songs - that funny, cheerful, deceitful, then sad, with soft, sincere, warm sound travels across Kazakhstan, becoming a favorite and very popular. 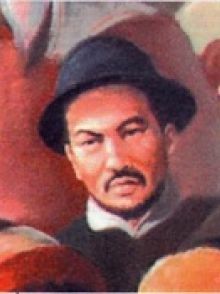 In the literature, the image of the Kazakh poet, composer and singer was the basis for the creation of the novel, drama, poems and numerous poems. The life and work Akana-sulfur devoted opera S.Muhamedzhanova "Akan-brimstone - Aktokty."